The most recent updates can be found at the bottom of this post. I've been trying to add updates as I find out new information to my original post, but I got some news today that I felt needed it's own post. It's a horrible, awful, word. And to have it be your grandson...well, it breaks my heart. My hubby is beside himself, and I just wish I could wrap my arms around Matthew, and his mom, and make it better. We're still waiting to find out what type of cancer it is, and what type of treatment will be necessary. There is also talk about getting a second opinion. I'm unsure of what will be happening in the next few days, but I will try to keep you updated. Matthew's mom posted this on Facebook today: "Update: The initial pathology report has confirmed that Matthew has brain cancer. They know it is one of two types of cancer, but awaiting tests telling them which type it is. He will require radiation and chemo, but the treatment plan will not be figured out until Friday when we know which type it is. Other than that, Matthew has been having a good day as he recovers from his surgery. Please keep Matthew in your prayers." PS. For those who have been asking about sending cards, if you email me at sara(at)foldedpaperprintedpixels.com, I can give you my address and I will happily send them along! It would be easiest to send one package to Matthew so he can get everything at once. 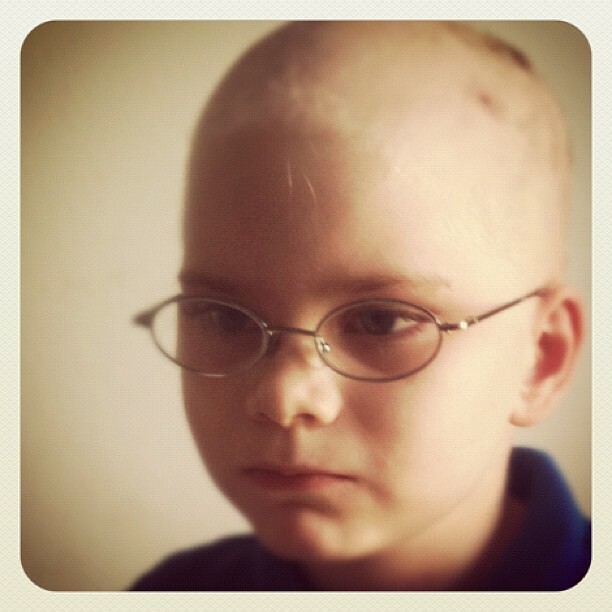 UPDATE 5/11 @ 10:30 PM: Matthew's pathology came back as anaplastic medulloblastoma. The treatment plan calls for six weeks of proton radiation, then a month off to recover followed by six months of chemo. UPDATE 5/17: Matthew had some surgery today to have the ports placed and have a spinal tap. Originally, his radiation was scheduled to begin on the 29th of May, but the doctors have moved that up, so it begins next week. Matthew is being really brave and has been cooperating fully with the doctors. We're all really proud of how strong he is!! UPDATE 6/8: After a shaky start, Matthew began his proton radiation this week. The original time frame got changed due to the fact that they had to sedate Matthew to keep him still during the procedure. Since Monday, he has received a daily dose, and yesterday he got a dose of chemotherapy as well as the radiation. Matthew is being a strong little fighter! Thank you for all of your prayers and support!! 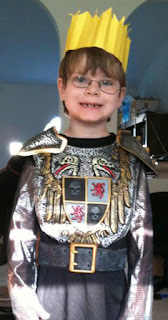 Update 6/17: This last Friday, Matthew celebrated his 8th birthday! From FB: "This is the first day in awhile that I have seen a glimpse of my typically happy boy. He probably consumed more calories today than he has in a week and his energy level was up because of it. It was a good day." The side effects from the proton radiation and chemo have started, and he's working hard to tough it out. On a positive note, despite missing a lot of school towards the end of the year, Matthew made the honor roll! UPDATE 7/9: Matthew's still in treatment. He's had a tough time with the side effects. His appetite is pretty non-existent and his mom has been trying just about everything to get him to eat. His hair started to fall out, and he was getting a real kick out of reaching up and pulling it out while his mom cringed. She was able to convince him to shave his head finally, and one of his grandpas and his stepdad shaved their heads in support. There will be a concert fundraiser in Boise next weekend (July 14th at the Powerhouse) to help raise money to help the family out. 8/3: "Matthew is doing "as well as the doctors expected." His last radiation treatment was 7/17 and he's been getting "a break" until August. We're not positive what date in August he will start his 6 months of chemo. He goes to Orlando once a week for blood work and to have his blood counts checked. He is very tired, but slowly gaining some weight back (Thank you Little Debbie Honey Buns!)." They've also found that his eyesight (which had worsened due to the pressure from the tumor) has gotten much better! 8/9: Matthew is still quite tired from the radiation treatments, but is anticipated to begin chemotherapy treatments on 8/27. He is registered for online classes so that he can keep up with his classmates. We are so grateful for you continued prayers and support!! I did forget to mention that we were able to Skype with Matthew and his family briefly during the benefit concert a few weeks ago. That beautiful smile of his was ear-to-ear as he got to rock out while one of the bands played, and wave to those who were in the audience. 8/17: From Facebook: "We just got the results of Matthew's MRI. They found another small tumor next to his lower spine. This will require more radiation to start after the first round of chemo." 8/30: Matthew is being released from the hospital this afternoon, after a week of chemo treatments. ONE DOWN!!!!!!! Next week he will begin another week long session of proton radiation therapy for the small tumor next to his spine. The tumor has been there all along, and has not grown or shrunk in the process of treatment, so they are only going to do a week of the radiation. 9/26: Matthew is undergoing his second round of chemo this week. Thanks so much for your continued prayers and support! The hospital that he is at posted a photo of Matthew with his stepdad on their FB page on his first day back for round 2! 10/13: Matthew made it through round 2, and is trying to get caught up with schoolwork. He's still having some appetite issues, and decided dill pickles were the bomb-diggity (does anyone still say that? ), so he was eating pickles and ONLY pickles for a while. Hopefully, with Halloween coming up, all the treats will be tempting him!! 10/23: Matthew is headed in for ROUND 3 of chemo. My fingers are crossed that he will be well enough to get some enjoyment out of Halloween next week! I am so sorry! I will keep him in my prayers. I felt like somebody just punched my chest when I read that awful word. Hang in there, Sara.....prayers are ongoing, and thank you, again, for your prayers for our Millie. so sorry to hear about this heart-breaking news. Hope the upcoming treatment will be a success. Liebe Sara, es ist schrecklich das zu lesen. Es tut mir so leid für Matthäus und für die ganze Familie. Ich werde weiter an euch denken und beten. I am so so sorry. I can only imagine what you are all going through. Prayers for you and your family that Matthew will slay this dragon with ease. As a grandmother of 4, I cannot imagine the heartbreak you are experiencing. Please know we are all praying for your family, and never give up, god works im mysterious ways. My thoughts and prayers to you and your family!! Sending prayers your family's way, for your grandson and for strength for you all to cope with everything as he continues with his treatment. Oh Sara what desperate news for you and your family. I know what you must be going through as I've had cancer twice now but when it happens to a child - it's just wrong. I'm sure all the love and prayers that are winging their way to you and your family will keep him strong. my heart goes out to you. I will continue to pray and hope all turns out well. You're all in my thoughts and prayers !!! Love from Holland, Jacqueline. Prayers for healing for Matthew and the entire family have been sent. May God wrap your family in His loving conforting arms. prayers going up for Matthew and the rest of the family. may god give you many bright days and may he give the doctors the wisdom to find the treatment for Matthew and Matthews body the strength to fit this. My thoughts and prayers are with Matthew and all of you in this time of greatest need. I have called my prayer list companions and we have added Matthew. I'm also going to be praying for you and the rest of the family. Sometimes the burden can be as great on the rest of the family so I'll keep you all in prayer. Trust that God is watching over all of you. What a sweet little guy - BIG prayers coming his way as the family all deals with this diagnosis. I am so sorry to hear of the news of your grandson! I have said a prayer for miraculous healing and will continue to pray for him. You,your Grandson, and parents are in my thoughts an prayers. Will be praying for Matthew and your family! Sara~Matthew & your family are in my prayers! God bless you all, and especially Matthew. We will be praying for Matthew, This just has to go, it has no right in Matthew's body and I will be praying against it in the Name of Jesus. Sara, I am so sorry to hear of Matthew's latest report. Please know that Matthew and the entire family are in my thoughts and prayers. Sara, so sorry to hear about your little grandson. My heart goes out to you and your family, hope the treatment is succesful. I don't know your family, but my thoughts, heart and prayers go up for your family and for your grandson. God bless. My heart goes out to you and your family!!! I had a sick daughter so I know how hard this is for all of you. And I will keep you all in my prayers. Take it one day at a time it's the only way that your going to get threw this. I know it's not much if you post a address I would like send cards to help your grandson along to help bring smiles to his face when things get harder for him. Take care of your self so you can be that strenght that your family is going to need. BIG HUGS!!! And lots of prayers are going to be said. God takes care of the children!!! My heart aches of this news. I keep asking myself why children? Oh my I will keep Matthew and the family in my thoughts and prayers. I have 6 grand children I am at a loss of words. It breaks my heart. Please keep us updated. My thoughts and prayers are with your you, you grandson and the rest of your family...remember if God brings you to it; he brings you through it. I have living proof within my own family (my son's life was spared after a terrible accident that happened 4 years ago; we believe that it was only through prayer and God's will that saved him). I know while you are going through this it is not always easy to be positive but rely on the strength of eachother and your friends (even us virtual ones you never met). God bless you and I will keep you all in my prayers. God bless you and your family, sending you love at this difficult time. What a sweet little boy...Sending positive thoughts & prayers to you and your family. Know that you have a large group of support right here for you during this difficult time. God Bless. Just sent prayers up to above and Matthew's own guardian angel. Know that our thoughts are with you at this horrible time and God willing he will come through the other end fit and well once again. I will put Matthew and your family on my prayer list. GOD is the great healer. Have faith, HE has a plan. Will keep checking for updates. My heart aches for all of you! My love and prayers to Matthew and each one of you. I have been through this with my husband and know how hard it is. Sending healing thoughts and prayers for the journey. God Bless and keep you all! Matthew is still mentioned in our prayers, each and every day.....he is a brave boy! Matthew and the entire family continue to be in my thoughts and prayers. I hope he gets some appetite back to at least keep him nourished. Hope the concert is a big success!! just want you to know that I still pray for Matthew and your family every day. I hope the card I sent arrived.... will send along another shortly. Please keep the updates coming. Lots of love and hugs!!! Yes, I would love to hear of more updates. You are all in my prayers. love and hugs coming your way. Nice to see a picture of Matthew and to hear that the doctors are pleased with his progress so far and that he is putting a little weight on. Sending love and hugs to you all. Still praying for Matthew! Thanks for the update. So sorry about them finding another tumour, but please know that Matthew is still in my daily prayers....hang in there! Thank you for the latest update, I pop on every once in a while to see how Matthew is doing, love the photo bless him, hope is doing well after his second round of chemo. Love and hugs to you all. Sending you a big hug, my friend. Another big hug from me. I have just found you and your blog, but wanted to let you know that your wonderful grandson and all of his family is in my prayers. I have heard that pickles can increase appetites and so if that is what you are going for, he may have a good idea? Prayers to you and your family. I can't even imagine if this happened to one of my granddaughters. Sara, think of you and your grandson often, keeping you in our thoughts & prayers. I check your blog often for updates. Lots of love from Texas. You & your family will be in our prayers. We wish you & yours only the very best.